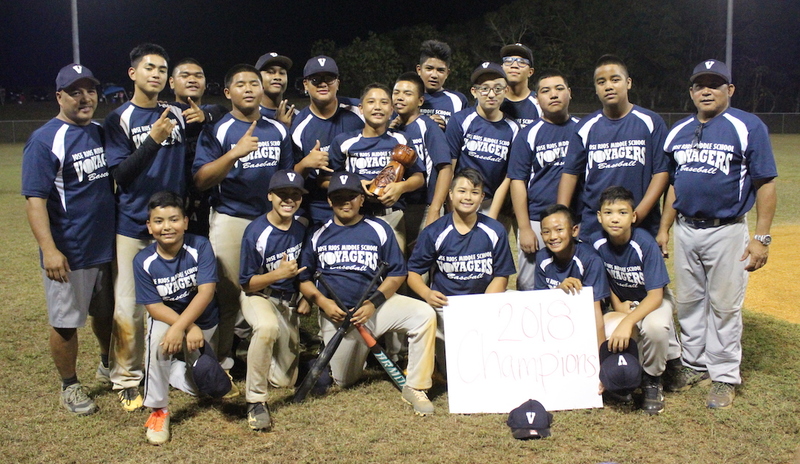 The Jose Rios Voyagers and the Wildcats from Untalan faced off at the Okkodo field Saturday evening in the GDOE Middle School Baseball Championship game. The Voyagers defeated the Wildcats 13-7 in a thriller of a ballgame. Wendy’s Player of the Game Dominic Cruz. Throughout the entire game, both teams were able to find a way to get runs on the board, however, Rios were more frequently getting runners home to celebrate a run. The Cats, on the other hand, gave JRMS a scare in the middle innings of the game. They were able to increase their score by five runs while holding the Voyagers to only a pair of runs in the respected span of time. Included in the 13 JRMS runs, were a pair of RBI singles from Dominic Cruz. “It felt good to help my team win and get the title,” Cruz said as his team celebrated and cheered behind him. Had it not been for the defense in the later half of the game, it may not have ended the way the Voyagers wanted it to. The defense was able to find a way around the heavy hitters the Wildcats had to offer by striking out four batters and having a dangerous trio of outfielders ready to catch anything hit their way. “We just had to have energy and get warmed up,” stated Cruz. Jose Rios Middle School’s defense came out of the dugout immediately ready to play in the first inning, shutting down the Wildcat offense completely. When the Voyager offense came out to the plate, three runs were produced. One was made possible by Dominic Avalos who hit a grounder to the first baseman letting leadoff batter Javen Pangelinan score the first run of the game. The next two came from an RBI single hit by Dominic Cruz, and an RBI triple made by Franklin Ninete, who was able to use his speed to safely run all the way to third base. The score after this was 3-0, Voyagers already making their statement. The game was all defense until the fourth inning, when Untalan began to threaten the Voyagers, scoring a pair of runs. Both of these were scored by RBIs, one from Trinidad, and the other from Gogue. This is when the Game began to thrill the crowd on both sides, tension building up with a score of 3-2. Jose Rios was only able to score two runs in the fourth inning due to Untalan having a period of no tolerance. Cruz was the batter responsible for both of these runs, hitting an RBI. This made the score 5-2, but the Voyagers would lose control come the next inning. The fifth inning is when UMS began to shine and gain attention from everyone as they earned a quick five runs. The first run was scored by Tenorio, hitting an RBI and clearing the way for Aguon. The following run was held responsible by Concepcion, who hit an RBI double. The other runs also came off of RBI doubles, which seemed to be the Voyagers’ weakness during the fifth inning. At the end of this, the Wildcats found themselves on top with a score of 7-4. However, the Voyagers recovered their fall to the bottom by scoring four more runs. All of these runs were made by Dominic Avalos, hitting an RBI triple and shortly after stealing home. This made the Voyagers find their game at 8-7, but it was still too close for comfort. The sixth inning is what really showed the champion capabilities JRMS had, striking back with a five run inning of their own a little bit after UMS had done the same thing. Four of these runs were made by Javen Pangelinan when he slammed a ball out deep, clearing the bases. This call seemed to upset the parents rooting for the Wildcats, as they displayed their disappointment. The last run of the game was made by Terlaje, who hit an RBI so Pangelinan could run home. The score at the end of the game was 13-7, the Voyagers coming out on top. Both teams deserve deep congratulations as both played like true champions.